Optus (Australia) Archives · Stop the Cap! Australia’s march towards an all-fiber future took an important step last week when the government announced a wide-ranging agreement with Telstra, the country’s largest phone company, to use Telstra’s existing infrastructure to help construct a national fiber network. After two years of negotiations, Australian Prime Minister Julia Gillard on Thursday announced an $11 billion deal between Telstra and NBN Co to allow NBN to use Telstra’s existing conduits, poles, and network facilities to provide a foundation for the construction of the all-fiber network and the removal of existing copper wiring. The deal is expected to save the government millions by not having to construct redundant facilities. The network is expected to take a decade to complete, and will provide optical fiber broadband to at least nine out of ten Australian households. The project will make Australia a global broadband leader, far ahead of the United States and Canada and most of western Europe. As part of the deal, Telstra agreed to pay $2 billion for upgrades to its own infrastructure in preparation of migrating customers to the NBN. Telstra’s CEO, David Thodey, said the agreement ended the uncertainty surrounding Telstra’s possible association with NBN and will allow his company to focus on customer service. Gillard and Communications Minister Stephen Conroy turned on Australia’s first connection to the NBN in May at the Presbyterian Ladies College in Armidale in the east Australian state of New South Wales. 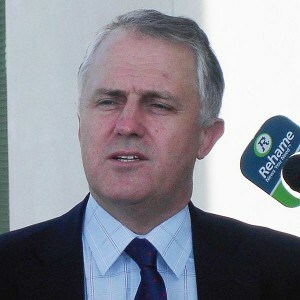 The town is one of five test markets where the NBN will first operate. Areas in Melbourne, Townsville, coastal New South Wales and South Australia will also be switched on in coming months. Liberal opposition to the NBN has been fierce in some quarters, with Opposition communications spokesman Malcolm Turnbull claiming the government is overspending on a network that delivers fiber straight to the home. Gillard accused the conservative opposition of seeking to rip installed fiber straight out of the ground if they were to come to power, a charge Turnbull rejects as ridiculous. He prefers a “fiber to the neighborhood” approach, similar to AT&T U-verse, which he says will bring good enough speeds to Australians faster and cheaper than an entirely fiber based network would. But fiber proponents claim the costs will come down as the network construction ramps up, delivering economy of scale. The government also believes fiber to the home is more upgradable and more reliable than a hybrid fiber-copper network. Most of all, Australians are celebrating the imminent end of usage-based pricing, fair access policies that reduce speeds of heavy users to near-dial-up, and the fact they are likely to be among the top-five ranked broadband nations globally when the network is complete. While some American broadband providers continue to dream of Internet Overcharging schemes for American customers, one of the world’s most usage-capped countries continues its march forward to abolish them. Australia’s Optus, a major broadband provider, today announced it was dramatically increasing usage allowances on customers, effective immediately. The Fusion 99 plan, which bundles telephone and broadband service, sees its data allowance increased from just 15GB of usage per month to 500GB (twice that of American cable giant Comcast). Ditto for the Fusion 109 plan, which originally doubled the 15GB limit to 30. Now it offers a 500GB allowance of usage. 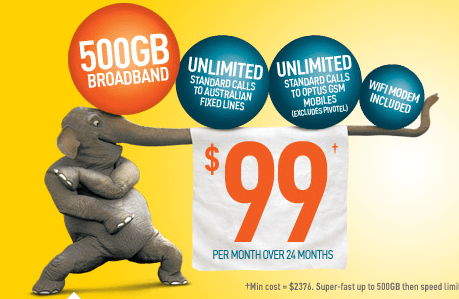 If 500GB isn’t enough, Optus has announced its Fusion 129 plan includes 1000GB — a terabyte — of usage per month, which includes unlimited long distance calling and calls to Australia’s mobile phone customers (most countries outside of North America require the calling party to pay mobile rates when calling a mobile customer). Even customers on Optus’ budget-minded standard and “naked” (standalone) broadband plans will benefit from new 500GB allowances. Those who manage to exceed their allowance will find broadband speeds reduced to 250kbps until the end of the billing cycle. Some Australian ISP’s take all limits off during off-peak usage hours. The country has traditionally suffered from usage caps because of international undersea cable capacity problems which restrict how much traffic can be sent and received between the South Pacific and North America and Europe. Increased undersea fiber capacity is tempering those traffic restrictions, and momentum towards unlimited use plans (or those with ridiculously high allowances) is the result. Lifehacker produced a broadband plan breakdown showing the dramatically increasing usage allowances for Australian broadband customers. Traffic shaping continues to be an issue, however. Such speed control measures traditionally target peer-to-peer traffic. Total cost is the total price of the service over the length of the term contract. This chart represents high end plans, typically offering the highest speed tiers. All dollar amounts are in Australian dollars.